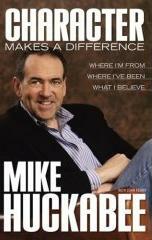 Click here for 18 full quotes from Mike Huckabee in the book Character Makes a Difference, by Mike Huckabee. If you feel like you've missed one too many Sundays at church, this book is for you. Gov. Mike Huckabee, a former pastor, preaches the Gospel (literally) in this ostensibly political book. Huckabee bashes "moral relativism," by which he means it's a bad idea for people to define what's right and what's wrong. God should define right and wrong, via the Bible and the Ten Commandments and so on. Those definitions should not change based on the idiosyncrasies of one society or another, or one time or another. Huckabee is entirely open about mixing church and state -- calling for prayer in public schools, legislating morality, and publicly posting the Ten Commandments. Most disconcertingly, Huckabee openly calls for supporting political "candidates who share your Christian standards." And he does not mean Jews or Muslims or Mormons who happen to share standards that coincide with Christian standards -- he suggests that in choosing our leaders we "support and uplift fellow Christians as we work together to build God's kingdom." Indeed, the title of the book, "Character Makes a Difference," unambiguously defines "character" as "Christian character." So one might re-title this book "Christianity Makes a Difference," which would sound very theocratic indeed. But the policy prescriptions in this book ARE theocracy -- so I don't see any reason to hedge on that point. Huckabee's candidacy is far from the first time a strong Christian has sought the presidency. Jimmy Carter was open about his religion and about the religious basis for his public policy; and when asked who was his favorite philosopher, George W. Bush cited Jesus Christ. But neither Carter nor Bush call for legislating morality -- they separate their religion from their public policy. Huckabee does not. I'd like to ask Huckabee about some of the finer points of his theocracy, such as: "Do you consider Mormonism a form of Christianity, and if not, would you advocate for NOT supporting Mitt Romney for president since he is not a Christian? Or what about Michael Bloomberg or Joe Lieberman, both Jewish?" Then applying his own philosophy internationally, "Do you support theocracy in Iran? The elected leaders of Iran DO have prayer in public schools, DO legislate morality, and DO publicly post the Ten Commandments, and even enforce them. What's the difference?" Of course, Huckabee won't be asked that kind of question, because Huckabee is not a frontrunner, and it's unlikely that any member of the mainstream press would read this book anyway. But Huckabee also describes in this book how he was once the frontrunner for the US Senate, and reveled in the possibility of being the first Republican Senator from Arkansas. That's likely in the future for Gov. Huckabee -- perhaps we'll get to ask him then. This book also provides a detailed history of the downfall of Jim Guy Tucker, who was convicted of a felony while Governor. Huckabee ascended from Lt. Governor (the two seats are elected separately in Arkansas, so their parties differed) after a last-minute drama of Tucker refusing to resign and Huckabee threatening impeachment. Huckabee has nothing but disdain for Tucker, on grounds that Tucker lacks integrity -- for which Huckabee provides numerous examples! Tucker's predecessor, Bill Clinton, is described in much more understanding terms by Huckabee -- focusing on Clinton's foibles as human weaknesses rather than lack of integrity. Having Huckabee in the presidential race will certainly keep things lively. One hopes he will point out when the other candidates fail to live up to his standards of integrity. He DOES have a lot of integrity himself -- and he IS consistent in applying it. So have at 'em, Mike! Consensus impossible: pro-choice world fundamentally differs. Gay tolerance reflects lack of fixed societal standards. People naturally selfish; only God or punishment prevent it. Defends death penalty biblically as well as politically. Drug education fails; drug punishment works. Ending school prayer was one step in society�s moral decay. Teach kids immovable standards of right & wrong. Attacking others� integrity reflects people�s own immorality. Govern by �Regnat Populus,� AR�s motto �The People Rule�. ARKids: Prevention less expensive than sick children. Character IS the issue; we DO legislate morality. Took office amid felony investigation of Gov. Jim Guy Tucker. Pastors & politicians have same skill set in common. Ten Commandments are basis for appropriate behavior. A �grace Christian�: dislikes �law Christians� AND liberals. One worldview will prevail: God-centered or human-centered. TV is like fire; pols must use it even though it can burn. Where I'm From, Where I've Been, and What I Believe, by Mike Huckabee.